So, P.J. (my lovely husband) loves cantaloupe, and I love prosciutto. You’d think that would mean we’d share a mutual love for the Italian classic of prosciutto-wrapped melon, right? Well, we have a small challenge – P.J. is vegetarian, and I wouldn’t say that I love cantaloupe. 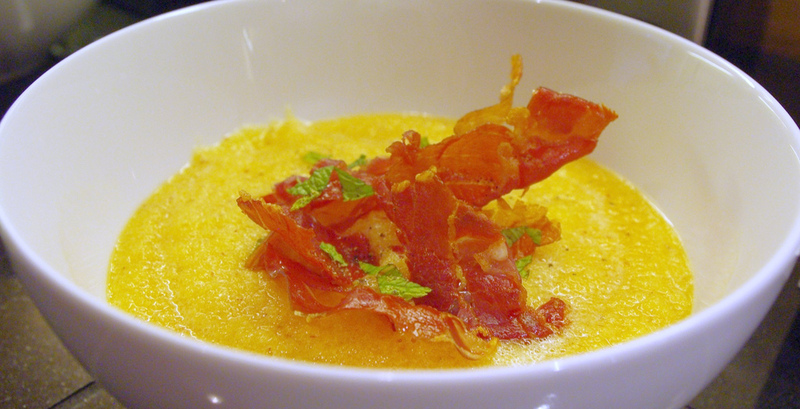 That said, I recently saw a recipe in Cooking Light for a cantaloupe-based chilled gazpacho with crispy prosciutto, and I thought I might give it a try. I’ll say up front that, while we both liked the dish, it was perhaps not our very favorite. Not because it’s not good, but more because the prosciutto really is a key element (which P.J. couldn’t eat), and as it turns out, I really just don’t care that much for cantaloupe. I realize the above is not the best sales job for this recipe… 😉 That said, I believe that if you’re a fan of cantaloupe and you’re up for adding the prosciutto, you’ll probably really like this one. You’ll find my adaptation after the jump. Place cantaloupe, peaches, water, shallot, lemon juice, vinegar, and salt in a blender or food processor (blade attachment) and blend until smooth. (I did this in two batches.) Transfer to a bowl and chill in the freezer while cooking prosciutto. Heat a skillet over medium heat and add cooking fat of choice. Add prosciutto, cooking until crisp (about 10 minutes). Transfer cooked prosciutto to a plate lined with a paper towel to drain. Scoop soup into serving bowls with a ladle (or measuring cup!) and top with prosciutto, mint, and pepper. I request that you make a tag for recipes that are vegetarian, or can be easily modified for the meatless among us. Please and thank you! Done, my dear! 🙂 You should see the “vegetarian-option” tag in the tag cloud for purely-veggie and veggie-optional dishes. Also, I’ve added a vegan tag where appropriate! Hope that helps! Made baked sweet potato fries tonight… vegan and AWESOME! Recipe coming shortly!